Alice Through the Looking Glass is a decidedly underwhelming film. As a solo outing it is aesthetically beautiful and graphically incredible – with fantastic outfits to boot – however the storyline is disjointed, the actors are either stifled or under-utilized (the waste of Andrew Scott’s cameo is an actual tragedy considering how wonderfully manic he can be) and the overall feeling is that of sad nostalgia as one wishes the film would suddenly morph into a Tim Burton classic. 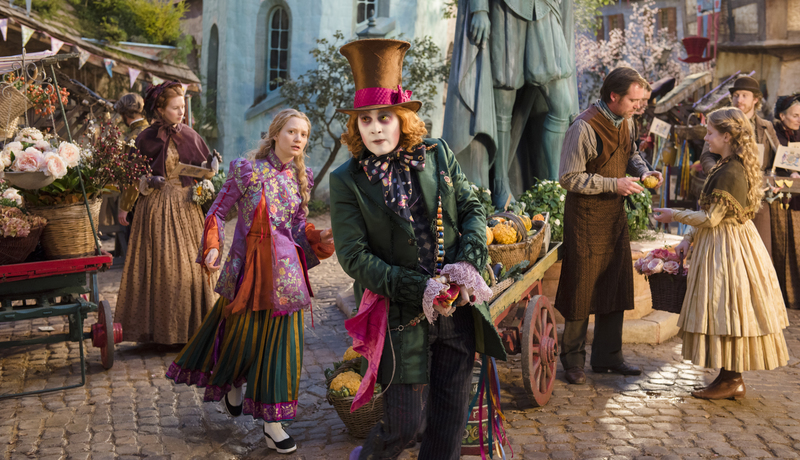 It lacks the fluidity and grand fairy tale aura that surrounds most Tim Burton films. The fact that the film was preceded by the trailer for Miss Peregrine’s s Home for Peculiar Children was an unfortunate considering the lack of Burton-esque moments in the proceeding film. Where the first film was a ‘theatrical production’ this is merely a sequel. That is not to say that it wasn’t enjoyable to watch, but it leaves the audience feeling disappointed and slightly disenchanted. It is evident from the opening of the film that it is not directed by Tim Burton. It is perceptible to the viewer through the dialogue that is the film is not quite there yet. This feeling of deception continues throughout the film as the viewer strives to find the charm and quirky beauty that was so prevalent in the first film. This feeling, although assuaged by the end of the film, is never quite satisfied as James Bobin attempts to recreate the magic of the first. Bobin is unable to grasp that the charm of Burton is his immense attention to detail and his understanding of the importance of the smaller moments in the film. Burton’s understanding of the importance of the little things is what made the first film stand out, as every moment was like a beautifully sculpted theatrical masterpiece. This film, on the other hand, is more like a mish-mash of action interspersed with moments of mediocrity. James Bobin wants to create a theatrical production but he seems to forget that he must first create a story that wants to become a theatrical production – something charming and funny and fantastical while simultaneously subtle and endearing in its quieter moments. Instead the film we see here is like a straight-to-TV family feature, its fun and cute but unexceptional. The constant onslaught of high speed action also made it feel like sitting through a Marvel film instead of a childhood classic. No offence to Marvel but walking into that cinema I didn’t want multiple high speed scenes and a constant onslaught of action. I wanted to be whisked away to Wonderland, to laugh with the Hatter, to dance with Mirana, and to defeat Iracebeth. As a solo outing it is fun and interesting but an overall unexceptional film. Watching the film was a bittersweet experience as one felt oneself constantly comparing it to the first film – or rather desperately wanting it to be the first film to be honest. Since the film is almost two films in one it deserves two separate ratings. As a solo film it is a 6/10. As a sequel to Alice in Wonderland , however, it is 4/10.